Sara Leavens from the Penn Libraries Advancement team and I met recently to have a 15-minute chat about what social media work means in 2017. We covered how Sara came to the libraries, what it looked like for her to compile all the Penn Libraries’ social media accounts under one umbrella, and what she thinks is the next big social media trend / need! Sara has one of the longest titles in the library: Communications, Marketing, and Social Media Coordinator at the Penn Libraries. Social media is 1/3 of Sara’s job. Anytime you read text from any of the Penn Libraries social media handles: @upennlib or The Penn Libraries, you’re reading Sara’s original copy or copy from colleagues that Sara has curated. Social media at the Penn Libraries is curated across platforms. The Penn Libraries has an account with Lynda.com which is part of LinkedIn. The certifications there were hugely helpful for Sara. Having a basic LinkedIn profile is so important because it gives you access to so many digital tools and allows you to keep up with platforms and social media how-to’s beyond the classroom. The Penn Libraries offers photoshoots for LinkedIn profile photos. 1/3 of Sara’s job is marketing, so she spent a lot of time in our chat talking about all the resources the libraries can provide to student to learn about media in the online landscape. More and more students are looking outside of their traditional classroom settings to learn about digital and social media production. The Penn Libraries has been a warm and welcoming space for its interns to create new media. 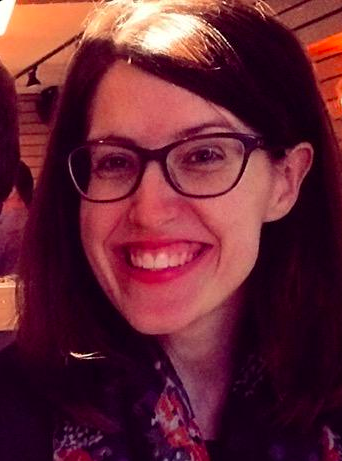 Sara’s background in creative writing and her MFA helped her curate an equally warm voice for the Penn Libraries text output. Creative writing experience + Sara’s generational experiences allow her to feel like the libraries is the best place for the merger between text and digital media. I mentioned that you need fundamental skills and keystone lessons in communication to become a good writer, but once you’ve taken those core classes, it’s fun to riff off of those basic skills and create new texts (digital, video, & audio texts). Does your social media presence bring you joy? Do you deliberately curate your feeds and timelines to only show you things that you want to see or are you, like many, at the mercy of endless algorithms? When you post on social media, is it once a month, once a day, or every time you think of something witty to say? In 2014, Marie Kondo published a now famous book about decluttering your physical life. One of her pieces of sage advice was to hold objects up, take a moment to assess how they make you feel, and then remove them from your life if they no longer bring you joy. After years of letting my social media overwhelm me, I’m starting to approach my personal social media philosophy in a similar way. Digital Fluencies / Web Design / SEO workshops at Weigle this month! This month is packed full of workshop goodness at Weigle! To help you build your web presence and take control of your digital footprint, graduate interns Chava Spivak-Birndorf and Jaime Marie Estrada are teaching a series of complementary workshops on social media, digital fluencies, and web design. Name and image recognition is very important online when you’re competing with so many millions of other people and brands for milliseconds of attention. For personal branding, pick a variation of your name and stick with it across your social media accounts and/or personal website. If you’re building a web presence for a professional brand, create a recognizable logo and choose one name to use across platforms. Learn more about how to do this in Jaime’s series of Digital Literacy workshops, which starts on April 8th with personal websites and LinkedIn. Nothing gives away that you’re not committed to your brand or that you don’t have time to maintain it like an old copyright date or an “updated date” that’s months or years old. 3. If you have a blog, keep it active. If you’re going to have your blog showing up on your personal website, it will immediately alienate your visitors if they see your blog is not regularly updated. It’s better to have a more static personal website with no blog than a static personal website and a static, old blog that’s not kept up. 4. Watch out for broken links. Broken links kill your credibility and drive your visitors to set out in search of better resources, which can hurt your ranking in Google and other search engines. Search engines want to deliver relevant results to their users, and when people don’t stick around on your site, it looks like your site isn’t one of them. Chava will teach you how to keep your “bounce rate” low in her web design and search engine optimization (SEO) workshops. You don’t need to establish active profiles across every platform immediately. Pick the platform you feel most comfortable with (e.g. Instagram, LinkedIn, WordPress, etc.) and develop your skills and quality content there. You can always broaden your reach after you get going. Ready to get started? Register at the links below! As the graduate intern for social media, I’ve been teaching social media workshops for Penn students, faculty, and staff at the Weigle Information Commons for over two years now. When I first started, it still was not clear what the purpose of social media was in the classroom or in academic life for that matter. However, more and more people are now buying into the idea of personal/professional branding and using social media platforms as learning tools. In the last two years, we have all noted the rise of social media usage and how the lines between personal, professional, and useful are blurring. With the close of election 2016, the beginning of 2017, and the resurgence of using social media to organize in-person gatherings and protests, there is absolutely no doubt that social media will continue to rise in importance for college-age Americans and those who serve them as educators, mentors, colleagues, and support staff. Here at the Penn Libraries, January has been an exciting time. On Saturday, the 14th, a hundred or so librarians, scientists, coders, hackers, and interested parties gathered to scrape data from NOAA.gov and other websites prior to the new administration potentially removing it from those sites. In addition, we have a series of workshops on identifying and avoiding “Fake News.” Individually, neither of these events is about “social media” in the way that my social media workshops are, but they are inherently linked to how undergraduate, graduate, and professional students use social media in their everyday lives on-and-off campus, in-and-out of the classroom. Fake news is often perpetuated through news feeds on social sites like Facebook, Twitter, etc. In addition, accessing real news, and learning about real “threats” such as losing valuable information about climate change or other public scientific data, also occurs on social media sites. Most of us access our news digitally and many of us access our news on social media platforms. The worry is that Millennials’ awareness of the world, as a result, is narrow, their discovery of events is incidental and passive, and that news is just one of many random elements in a social feed. While Millennials are highly equipped, it is not true they are constantly connected. More than 90 percent of adults age 18-34 surveyed own smartphones, and half own tablets. But only half (51 percent) say they are online most or all of the day. Email is the most common digital activity, but news is a significant part of the online lives of Millennials, as well. Fully 69 percent report getting news at least once a day — 40 percent several times a day. Millennials acquire news for many reasons, which include a fairly even mix of civic motivations (74 percent), problem-solving needs (63 percent), and social factors (67 percent) such as talking about it with friends. As we look forward into this new year, I plan to attend as many workshops and teach as many workshops as possible about how to continue to be a responsible consumer of media. Keep the Penn Weigle Information Commons and the Penn Libraries’ programming sites bookmarked as these are themes that we continue to explore as a university and a community. Why social media at Penn? Social media at Penn and in college, graduate school, and in the professional world is not about scrubbing all traces of who you are off the internet. It’s about creating content that you are “sincerely” passionate about engaging with and making connections online that will lead to IRL experiences like your next research project, a career, a new friend, or an amazing conference experience. Michelle Bookyung Jo is a junior in the College of Arts and Sciences studying communication. In this post, she shares her experiences working at Weigle Information Commons as a Social Media Manager and discusses our strategies for actively engaging the Penn community. I have always known that Weigle Information Commons has a lot going on, on top of the study booths and group study rooms students reserve throughout the semester. Working as a social media student worker at WIC for the past academic year, I not only learned more about what WIC is but also gained important hands-on experiences managing social media accounts to connect with WIC’s audience. Are you a Mac or PC user? Want to learn how to use one or the other? Booth 1 @pennwic now has both! Pictured: Michelle Bookyung Jo testdriving our newest, state-of-the art macbook. WIC has various online channels through which it reaches the Penn community. 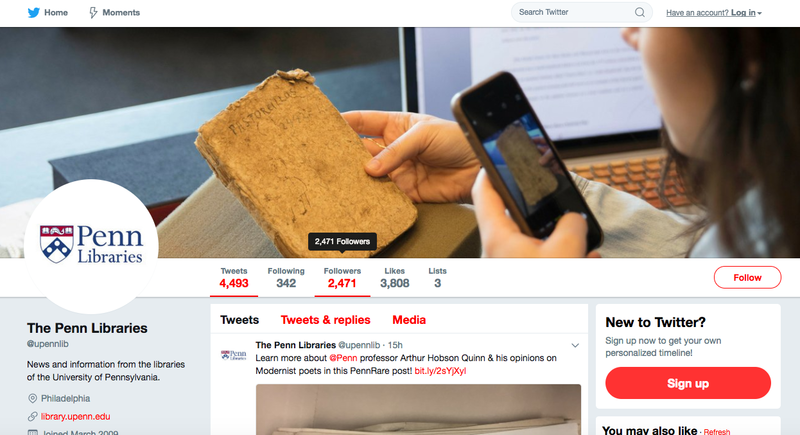 It has its own Twitter and Instagram account and also contributes to the Penn Libraries social media channels: @upennlib on Twitter, Instagram, Facebook; pennlibraries on Youtube; and University of Pennsylvania Libraries on Flickr. Focusing on Twitter and Instagram, I got to see who WIC connects with and what WIC is for the Penn community. My most basic job responsibility was scheduling tweets for WIC’s weekly workshops, but I explored more ways to leverage social media channels and use Twitter as a way to promote WIC as a resource for everyone. Some weeks I focused on updating the audience about various types of digital support WIC offers including digital device rentals. Some other weeks, I focused on major upcoming events in WIC such as the Engaging Students through Technology Symposium and Diversi-Tea sessions. More importantly, trying to see WIC’s social media presence from an undergraduate student’s perspective, I tried to make the social media channels as current as possible, posting pictures of workshops and any ongoing events at WIC. The most challenging part of my job was to make sure that our content reaches not just Penn faculty but Penn students as well. We understand that following many subsidiary accounts within the University may not be as appealing as following the main “uofpenn” account, but I still wanted to make sure that there will be content for students should they find us interesting and look for more. Such an effort was mostly made on WIC’s Instagram account, and it has been a channel where I post more up-to-date content about WIC. As an undergraduate student worker, I realized that there is a lot going on at WIC. I would like to invite fellow undergraduate students to know that any digital or technology-related support is available at WIC and encourage everyone to check our blog and social media channels from time to time.